Week 15: Exam week. But this is also the LAST week of school for Year 1 Semester 1! School has been so busy, especially towards the end of semester. There were endless project presentations and report deadlines to meet. I’ve been returning to school almost everyday for the past three weeks and i haven have proper time spent with my family for a long time. On the bright side, I am looking forward to FRIDAY (my last paper)!!! After which will be a looooooong SUMMER BREAK for about 2-3 months! Can’t wait for summer then i will resume my healthy lifestyle and spending lots of time in the kitchen, trying out the different recipes that i have bookmarked! I’ve been craving for bananas recently and this explains my sudden consecutive banana posts. HAHAHA. 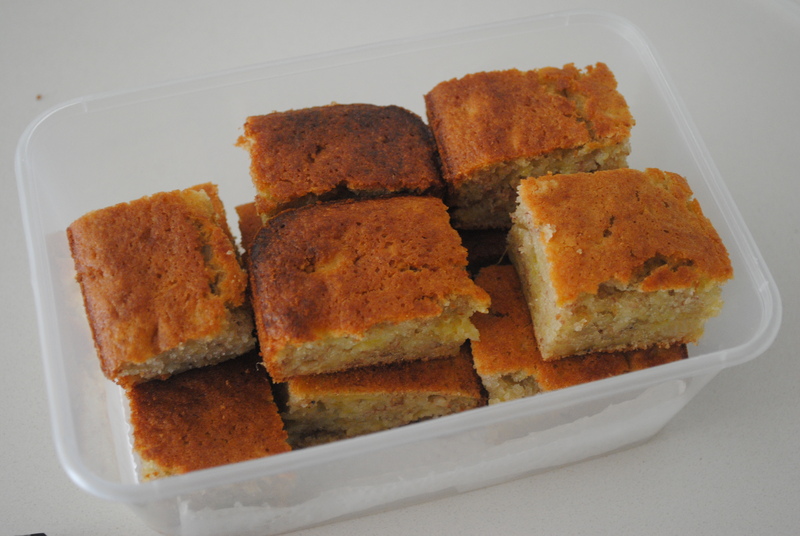 Talking about banana squares, I love those from fourleaves. Craving for them so i decided to bake them myself. I thought the cakes were a little too moist. I used 5 bananas but my bananas weren’t exactly very very ripe. 1. In a large bowl, mash the bananas with a fork. 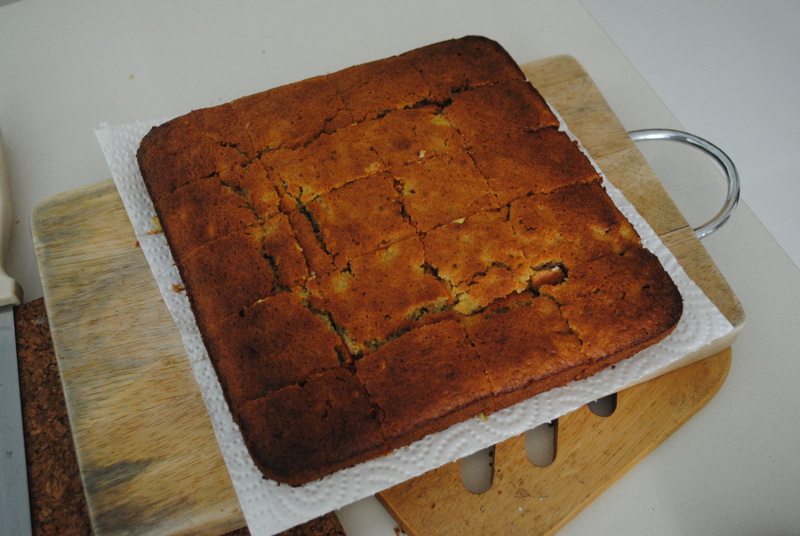 Leave some chunks if you want bits of banana in your cake. 2. Add milk, sugar, oil, rum and combine using a small whisk. 3. In a separate bowl, mix flour, baking powder and baking soda, and give a quick mix. * Note: I only sifted the baking soda because it tends to be lumpy. Didn’t even bother with the flour or baking powder. 4. Add the dry ingredients to the wet ingredients and whisk gently to combine (don’t whip and introduce air into the batter). As long as no traces of flour remain, you are ready to bake. Yes, 2 bowls, 1 fork, 1 whisk. That’s it. 5. Pour into a lined square tin. 6. Bake at 175°C for about 30mins, or until a skewer comes out clean. 2. Add condensed milk and rum and mix it w a spoon or your hands. I added the condensed milk 1 tbsp at a time until it is sticky enough to roll them into balls. Actually I think it depends what kind of chocolate cake you are using. If your chocolate cake recipe is pretty compact-brownielike then u can probably reduce your condense milk. 3. 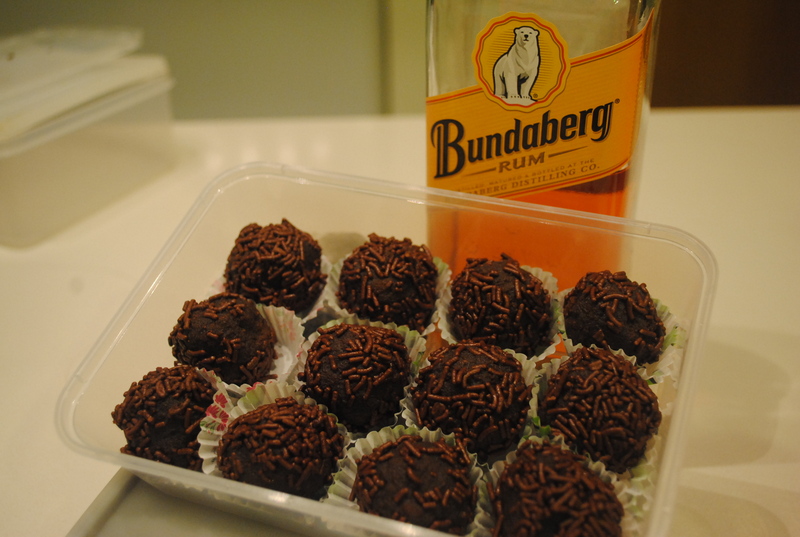 Roll your cake mixture into balls. 4. Coat them with milk and chocolate rice and place them on a plate. 5. Store them in an air tight container in the fridge. Made this for my sis’s birthday. 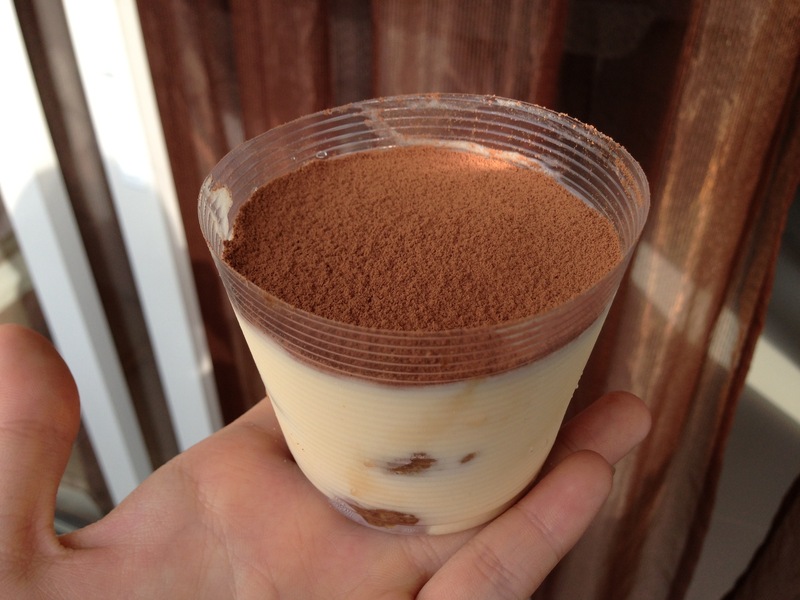 ^^ this is the second time I am making tiramisu! My first attempt was probably 7 years ago which I made with my sister, when both if us have zero knowledge about baking. I rmbed us ultimately adding about double the number of eggs the recipe asked for because of.. Ican’treallyrmb the reason. There were too much coffee too, beyond saturation point of the lady fingers. In the end, the tiramisu was inedible. But this time, I was glad it turned out fine. Not perfect yet though. I made some adjustments to the original recipe. Instead of soaking/dipping the lady fingers into the coffee, I used a table spoon to pour the coffee mixture onto the lady fingers. I tried the dipping method and my ladyfingers immediately melted..
6. Use a tbsp and pour the coffee mixture onto the ladyfingers until saturated. Rmb not to pour too much. Then layer them over the mascarpone cream in each vessel. Use two ladyfingers per. Baking at night is a dangerous move. Esp to your waist line. There is poor lighting. Your pics wouldn’t appear nice. The most fatal move is to eat yr bakes at NIGHT. Yr bakes are screaming for you,”eat me! Eat me! !” how cld you resist the temptation and excitement to try your new recipe. But it’s a MEGAKILL To your waist.. I just baked my rum n raisin cakes. I have been eyeing on that since I saw them at mykitchensnippets. 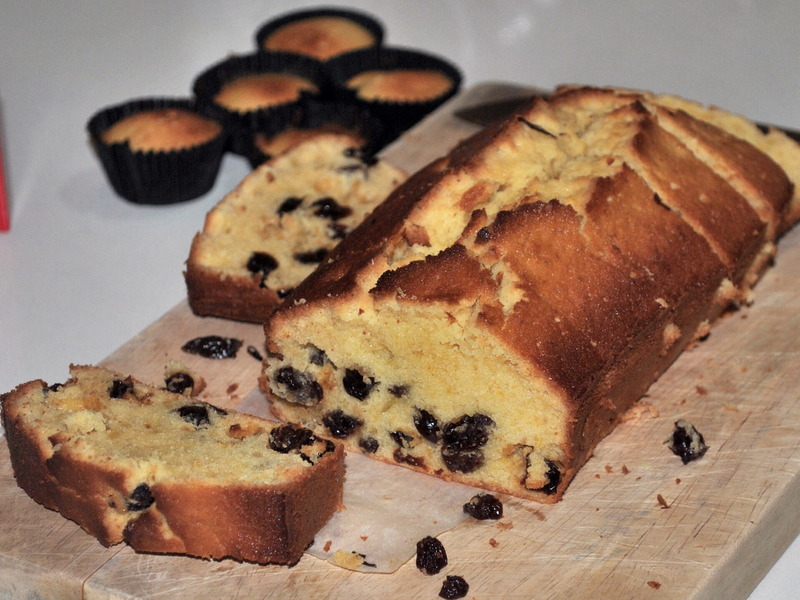 Her rum and raisin cakes are so lovely. But the top of my cake cracked into a volcano while baking. Can someone pls tell me how to achieve a smooth and even texture? I halved the recipe. I converted mine into metric units. For the original recipe, pls click here. 1. Pre-heat the oven to 180degree C.Line and butter a loaf pan. Sieve together the flour, baking powder and salt and set it aside. 4. Pour the batter into the baking pan and bake for abt 30mins until golden brown skewer inserted into cake comes out clean. Remove from oven and let it cool in pan for 10 minutes, then turn out onto the rack and allow it to cool completely before cutting into it.